Karnataka Palaces are great monuments of Karnataka as well as South India. The main palaces are Mysore Palace, Bangalore Palace, Tipu Sultan Palace and more. 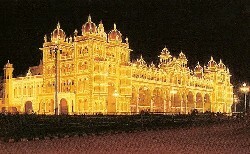 Mysore Palace is located at Mysore in Karnataka State. It is also known as Maharaja's Palace, royal residence of the Wodeyar rulers. It is built based on the Indo-Saracenic style,designed by the renowned British architect Henry Irwin. The Palace stands elegantly for the past century as a stunning piece of history and the most splendid palatial structure. The entrance of the palace is through the Gombe Thotti, which is also known as the Doll's Pavilion. It is a storehouse of beautiful carvings and works of art from all over the world. The stained glass roof of the 'Kalyana Mandapa' wall paintings, ivory inlaid rosewood doors and the ornate golden throne here, are all remarkable. The palace is illuminated on Sundays and National holidays from 7:00 p.m. to 8 p.m. and during Dussehra festival from 7:00 p.m. to 9 p.m.
Lalitha Mahal Palace is located about 11 kms from the city of Mysore. It was built in 1921 by Maharaja Krishnaraja Wodeyar IV and was designed by E.W Fritchley in the Renaissance style with concepts from the Italina palazzo and the English manor. Nestling at the foot of the Chamundi Hills, the pleasing white structure was modeled in the lines of St. Paul's Cathedral in London. Now it is coverted into a star hotel. However, the building continues to retain various aspects of the Palace including the Viceroy room, the Banquet hall, the Ballroom and the stately Italian marble staircases. It is a heritage building. It is one of the Karnataka palaces that still retains its glory. The Lalitha Mahal Palace Hotel offers royal living and dining in the environs of a real palace. Bangalore Palace is located in right in the heart of the Bangalore city. It was built by Chamaraja Wodeyar, Maharaja of Mysore in 1887, in Tudor style. The Palace flaunts turreted parapets, battlements, fortified towers and arches. The Bangalore Palace is famous for its elegantly carved wooden interiors. This unique edifice gives the feeling of a piece of England's architecture in Bangalore. During a visit to England, Chamaraja Wodeyar was inspired by the Windsor Castle in London, and along similar lines he built this magnificent palace in Tudor style. The palace was earlier surrounded by beautiful gardens in the midst of a vast open area, which have reduced considerably today. Spread over an area of about 430 acres, this Karnataka Palace is famous for its elegantly carved woodwork. With a built-up area of around 45,000 sq. ft., this 120 year old monument is a popular tourist attraction among Karnataka palaces. It is surrounded by a garden all around, almost giving it a fairytale setting. The structure has fortified towers complete with Gothic windows, battlements and turrets. This palace is largely constructed of wood, and is famous for its carving and paintings. An exquisite door panel at the entrance leads to grand settings inside. The palace ground has become a venue for various exhibitions, concerts and cultural programs. The palace is truly an architectural splendour. The interiors have breathtaking floral motifs, cornices, mouldings and relief paintings on its ceilings. Lotus Mahal Palace is located at the historic Hampi town in Karnataka State.This graceful two-storeyed pavilion is situated in the Zenana enclosure. The structure of this palace is different from the awesome magnificence of Hampi's temples. The architecture of this palace is a mixture of Hindu and Islamic styles. The palace with recessed archways, the vast Elephant Stables, and the Mahanavami Dibba gives a glimpse of the past glory of the kingdom. The building is an open pavilion on the lesser level and built up with windows and balconies on the upper level. The palace gets its name from the carefully recessed archways, set in geometric regularity and opening out to the sun and the wind, like the petals of a flower. Jaganmohan Palace is located in Mysore, Karnataka State. It was built in 1861 by Maharaja Krishnaraja Wodeyar, and is one of the oldest buildings in Mysore. This three storied palace with stained glass shutters and ventilators is located about 10 minutes walk from the City Bus Stand. It is now converted into Jayachamarajendra Art Gallery, a treasure house of paintings of unparalleled beauty, handicrafts, a rare collection of musical instruments and historical memorabilia dating back to the nineteenth century and earlier. This Karnataka palace also attracts many tourists.